The best paint sprayer reviews for home paint sprayers, professional paint sprayers and everything in between. There is a huge difference between all the various types of paint sprayers and if you buy the wrong type, you will be left with either a shoddy or unfinished job because you couldn’t get the paint to spray correctly. It’s important you choose the best paint sprayer for the particular job at hand, whether it’s internal walls , spraying furniture or spraying your car. Smaller jobs such as furniture spraying require highly controllable machines that give you a good finish and an element of finesse when spraying. Whereas if you are planning to paint the walls in your home, an airless paint sprayer provides high-speed painting to get the job done fast. There is some cross over if you have a lot of experience with paint spraying, but it still doesn’t mean that the sprayer is suited for that purpose. What Are The Main Benefits of a Paint Sprayer? Speed – They’re Extremely Quick! Q: IS PAINT SPRAYING DIFFICULT FOR BEGINNERS? Q: HOW LONG DOES CLEANING THE MACHINE TAKE? Q: DOES IT MATTER WHICH TYPE OF PAINT SPRAYER I BUY? Q: IS IT WORTH ALL THE EXTRA TIME PREPPING? Q: DOES IT MATTER WHICH BRAND I BUY? Q: WHAT KIND OF PAINT DO YOU RECOMMEND? Q: DO I NEED TO DILUTE THE PAINT & BY HOW MUCH? Q: WHAT DOES HVLP STAND FOR? Q: WHAT ARE SPRAY TIPS & NOZZLES? DO I NEED THEM? Q: JUST HOW MESSY ARE PAINT SPRAYERS? Below you’ll find our best paint sprayer reviews for the most popular applications, and below that the type of machines, you should be looking at for each purpose. The REXBETI Ultimate – 750 is a great choice for when you have never used a paint sprayer before. It is very lightweight, weighing less than 4 pounds, and user-friendly thanks to the clear instructions and easy handling. This model has 3 spray patterns that you can switch between using the twisting knob: circular 45°, horizontal 90° and vertical 180°. Changing the flow rate of the paint is just as easy with the flow control knob near the handle. One of the disadvantages of a paint sprayer is usually how long it takes to clean but that is not the case with the REXBETI Ultimate – 750 model. This model comes with a detachable paint container with a volume of 1 liter which gives you a quicker cleanup. The REXBETI Ultimate – 750 is an easy-to-use handheld solution for anyone with a big paint job to do and little time to complete it. It has a power of 500 watts with a maximum flow rate of 750 ml per minute. The Graco Magnum 257025 is the type of home improvement equipment that you are grateful to have with each DIY project. This paint sprayer has been specifically designed for the new user and is one of the best for painting interior walls. It is also one of those tools that you don’t have to worry about missing parts when left in storage. It comes fitted with several extra storage spaces attached for keeping things like the spray tips and cords together. One of the best features is that it is suitable for both indoor projects like interior walls and outdoor projects like painting fences and decks. 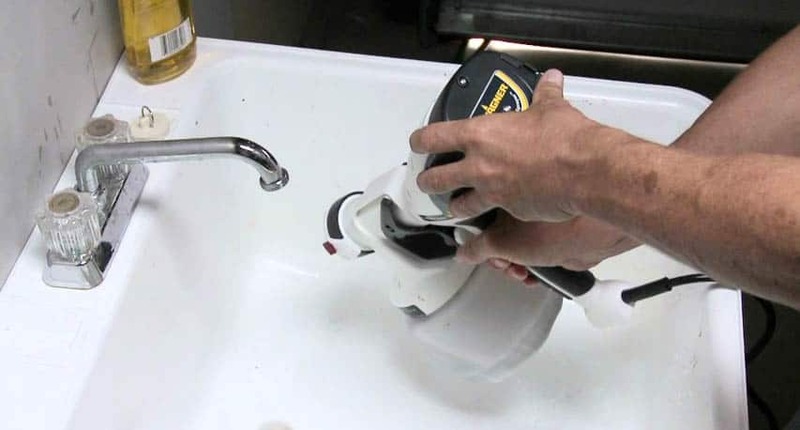 The power flush on the paint sprayer even connects to a garden hose so that you can use its power for a quick cleanup. Cleanup is already made faster with this model since there is no separate paint container. Instead, you can directly paint from a 1 gallon or 5-gallon paint bucket thanks to the flexible suction tube. Another great feature is the reverse-a-clean which clears the spray tips with a flick of the tip. Clogged spray tips are a common problem with paint sprayers but not with this model. Our favorite budget buy is the HomeRight Finish Max because it is lightweight, easy to clean, made of good quality materials and precise. Plus, it is compatible with all kinds of paint, both oil and water-based paints but also varnish and clear sealer. The HomeRight Finish Max is even more lightweight than the REXBETI Ultimate – 750 as it only weighs only 2.8 pounds. However, the paint container is also slightly smaller with a maximum volume of 27 ounces. The precise spray pattern of the HomeRight Finish Max comes from the brass tips and needles which won’t wear from temperature changes like plastic tips and needles would. This is what makes this paint sprayer model ideal for painting furniture and intricate patterns on outdoor wooden structures. Another feature that helps to give a precise spray is the seal and splash guard. Together they prevent leaking and paint from entering back into the nozzle which can cause the tip to get clogged. Finally, the manufacturers pay close attention to after-sale care because they offer a 2 year warranty and have a US based customer care department that you can call or e-mail with any questions about their product. This is the more advanced brother to the Graco Magnum 257025 model that we plugged as the best model for a home DIYer. We’ve written a Graco Magnum X5 review before, and shown that it has more power than any other on this list and can handle up to 125 gallons of paint per year. Like the smaller model, the Graco Magnum 262800 X5 can directly spray from a paint bucket thanks to its flexible suction tube. It also holds enough power for you to use a paint hose up to 75 feet long for jobs that are high up or difficult to reach. 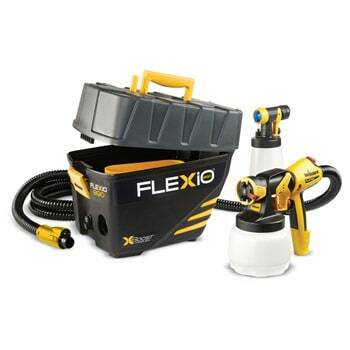 What is even better about this model is that you don’t need to thin out the paint first because this paint sprayer is able to give a precise spray with paint straight from the bucket. This is possible thanks to the way airless paint sprayers work and the stainless steel piston pump that operates at high pressure. 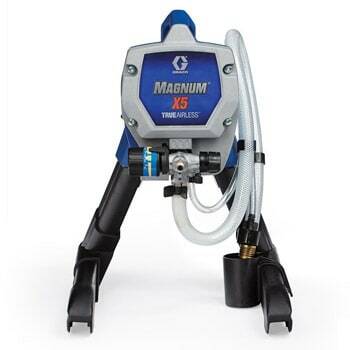 Aside from the extra power, this model still has all the benefits of the smaller model including a reverse-a-clean for preventing clogs in spray tips, a power flush that connects to garden hoses for quicker cleanup and a pressure control knob for adjusting the paint flow. This turbine spray painter by Wagner Spraytech is a two-in-one deal since it can be used for larger jobs with the iSpray nozzle and for detailing work and finishing with the Detail Finish Nozzle. The iSpray nozzle has a detachable 1-quart paint container and the Detail Finish Nozzle a detachable 20 ounce paint container. The turbine box on the Flexio 890 is designed to be placed on the floor so that your hands are more flexible and your arms are not bogged down by a weight. 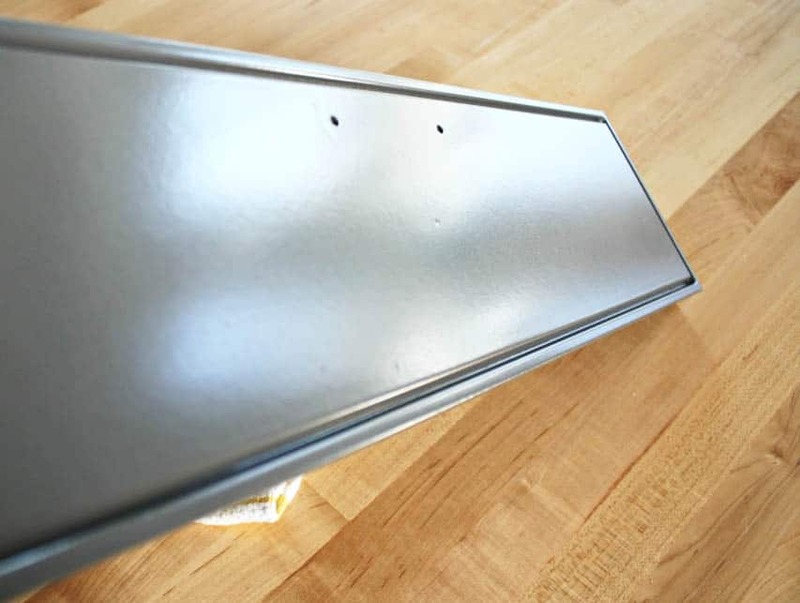 The turbine box also has a double function as it is the perfect size for storing all the separate parts after cleaning. The Wagner Spraytech Flexio 890 is suitable for both indoor and outdoor projects. It has all the power for performing large jobs: it sprays up to 8.4 gallons of paint per hour and can cover an 8 x 10-inch surface in just 5 minutes. If you are looking for a versatile paint sprayer then the Wagner Spraytech Flexio 890 is a good bet. We recommend this model for semi-professionals that want to perform their jobs quicker and still have the control for precision jobs using the same paint sprayer. Check out the full in-depth Wagner Flexio 890 review to learn more about this turbine paint sprayer. And there you have it, our top 5 overall best paint sprayer reviews. But before you leave, we’ve got a huge guide to paint spraying below for you and be sure to check out the rest of the site for the best paint sprayers for specific uses and applications. We’ve rounded up the best painting spraying tips and tricks from the pros. 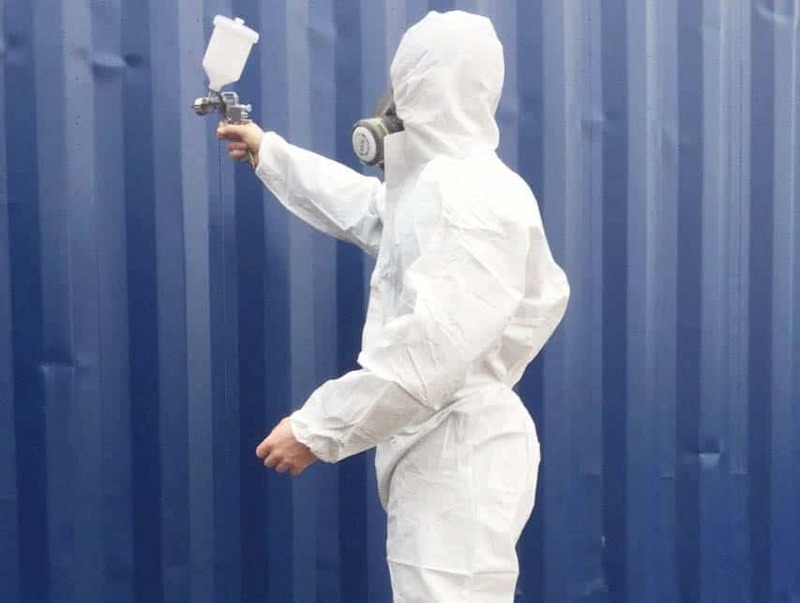 From area preparation to testing your sprayer, here are the top 5 beginner tips when you’re about to start paint spraying. The art of using an expensive or cheap paint sprayer efficiently lies in the preparation. This means having all the tools to hand, having the room or area fully masked, covered and the walls prepared for painting before you even start priming your paint machine. You should make sure you have enough paint available to finish the job you are about to start and have water or thinners (paint stripper) nearby for thinning your paint if required. One vital part of the preparation process that many people ignore is having some cardboard or a plastic bag handy for unclogging the spray tip/nozzle. It’s not uncommon for a spray tip to become clogged during spraying so having an area you can de-clog quickly without powering down help can save a lot of time. Masking is a pain that no one likes doing, but it has to be done and it has to be done right. If it’s not done well, the result will be a shoddy looking job no matter how expensive or cheap your paint sprayer was. The quality of the finished paint job mostly lies in the masking and preparation, so do this right and you are 70% of the way to a professional job. Many people think that all masking tapes are alike, but this couldn’t be further from the truth. 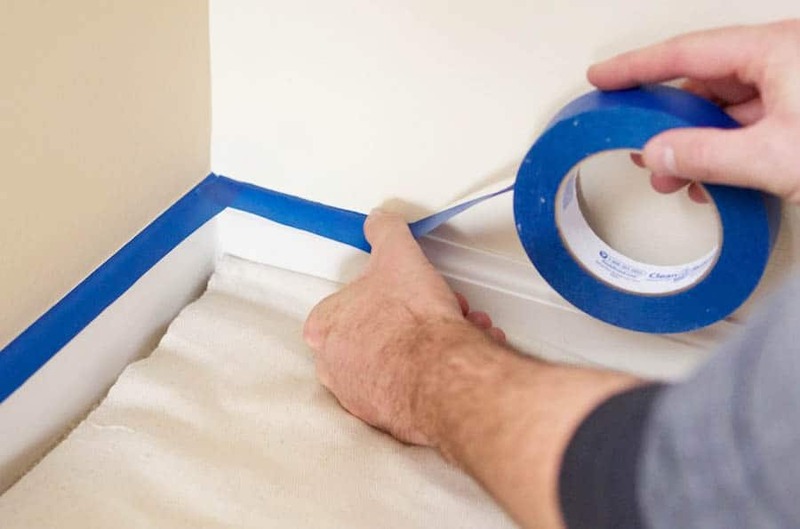 Cheap masking tape will often allow paint to bleed into the edges of the tape, tear on removal, or be too sticky. Other room preparation equipment you should look into purchasing includes zip door protectors, specialist stair plastic covering and a bunch of disposable polythene dust sheets. You can find our full list of protective materials here (opens in new tab). 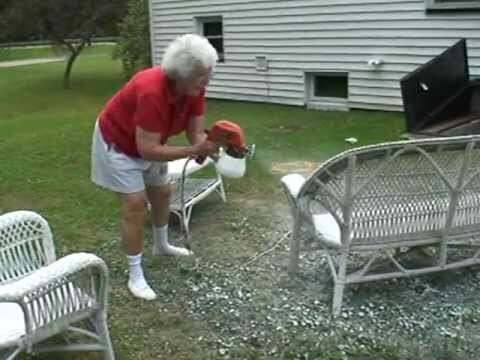 Fixing mistakes and drips from spray paint guns can be a time-consuming process. Waiting for the paint to dry completely, then sanding it and then re-painting it can easily take hours and cause a lot of frustration. Most beginner issues occur because the spray paint machine hasn’t been primed properly and air remains in the system causing splutters and ‘blobs’ on the object being painted or they underestimated their new powerful paint sprayer. This can often be avoided by testing the sprayer on either a large piece of cardboard or simply spraying into a bag until you are satisfied the machine is fully primed and no longer spitting. We have no doubt that you will already be wearing old clothes under your protective overalls/coveralls, but cheap coveralls can still leak paint. They are disposable, mass-produced and often poorly made. Getting paint out of your hair and off your skin can be a pain and time consuming, especially if it’s an oil-based paint such as gloss. We highly recommend you invest in some good decorating protection that does the purpose it is intended for. Most people fail to look ahead at what they’ll need to finish the day, which leaves them clambering around the house in paint caked shoes trying to get water, wipes and rags. By having all of these to hand before you start, you will save yourself traipsing paint everywhere and some hassle by having paint dry in your equipment. We recommend you have a pack of Solvent Wipes, a bucket of water, an empty bucket and clean, paint-free rags readily available to cover all eventualities. Preparation is key. Once you’ve painted a room, furniture or anything else for that matter, it’s important to let it air dry in a dust and debris free environment. 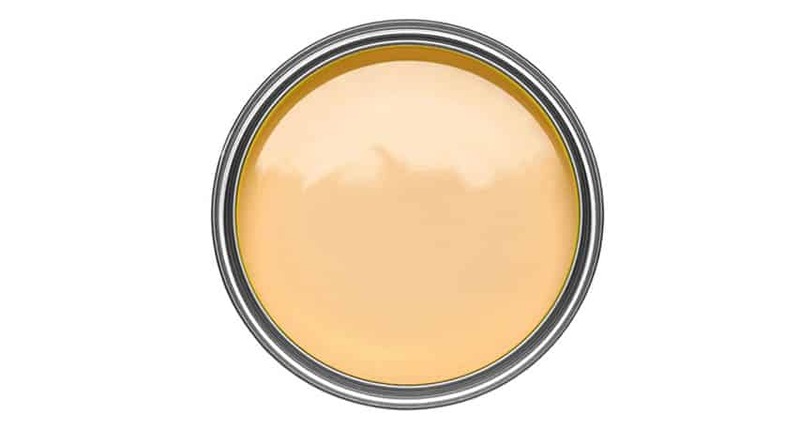 This is especially critical if you’re painting inside with exterior paint, exterior paint is made from a cocktail of harmful chemicals which prevent it from the elements, so be sure to keep all doors and windows open throughout. This could lead to leaves and unwanted bugs getting stuck in your paint. If you’re spraying outside, move the sprayed object into an airy room such as a garage for drying. The biggest advantage of paint sprayers over traditional methods is their speed. Whilst the speed of the sprayer varies massively depending on the technology the sprayer uses, paint spraying is still estimated to be 5-10x faster than using a brush or roller and will also provide a considerably better finish. It’s important to understand that speed isn’t always your friend even for professional spray painters, especially with detailed work. Having the right type of paint sprayer for the job is vital in making spray painting a better, faster alternative to a good old brush and paint pot. If you have ever tried a paint a fence or popcorn ceiling, you will know just how time-consuming and frustrating it is. Coupled with the fact that your neck is bent back at a near 90 degree angle for hours when painting a ceiling, it’s a painful task that we wouldn’t wish upon our worst enemy. With a paint sprayer, however, all of these frustrations go away as you breeze back and forth over the large area and all the nooks and crannies are painted with just a few passes of the spray gun. Saving you hours of precious time and stress. One of the main reasons people prefer spraying paint instead of brushing is the outstanding quality of the professional paint job they get. This is of course especially important within the paint sprayers for cars and furniture paint spraying, with the paint being the first impression of the quality of the product. If an exceptional finish is the main goal on your project, then choosing the best paint sprayer is essential in ensuring you are able to get a consistent high-end finish that doesn’t contain flaws and defects. If you are about to decorate your house, many people immediately think of hiring a contractor to do the work. Hiring a contractor to paint JUST THE EXTERIOR of a 3 bedroom home could easily end up costing $3000+ in labor alone. Painting is not difficult but most avoid it due to the time it takes and toll it takes on your body when painting for long periods of time. If you are keen to save money and are happy to invest some time, then spending a few hundred bucks in a good airless paint sprayer could save you several thousand dollars. Paint spraying can be daunting the first time you start looking into it, with so many types, brands, sizes and price points, it’s extremely difficult for beginners to know which way to look when they first start shopping online. But… paint spraying is actually very easy once you have been given some guidance of the type of paint sprayer you need for the project. Having the right type of paint sprayer is half the work, once you have got this it just takes a small amount of practice to get the technique and you will be spraying like a pro in no time. Paint sprayers are extremely handy to have in the garage and depending on the type you buy, can be used for a wide range of different jobs. From paint sprayers for interior walls, to protecting the outside with a new coat of masonry paint, having a paint sprayer available can save you a lot of time and money over the years. Not to mention once your friends and family see the quality of the finish they’ll no doubt be offering to pay you to come and paint their living room and throwing a few hundred dollars your way for your troubles. Paint sprayers certainly have more pros than cons, but there a few small caveats that you should know before deciding to invest your hard earned cash on the best paint sprayer on the market. Here’s a few things to consider before you start the serious shopping. Depending on the type of sprayer you buy, paint spraying can be messy and often requires a lot of masking and preparation. This can put some people off of using paint sprayers, but the pros still outweigh the cons in most peoples’ eyes. Airless paint sprayers are the messiest, followed by conventional compressor spray systems, with HVLP & LVLP spray systems being the least messy types of paint sprayer. The additional preparation time involved when using a paint sprayer can be a bit of a paint, but when paint sprayers provide between a 5-10x speed increase when compared to traditional brush and roller method. It’s estimated that for every hour you spend masking up, you will be able to save around 4 hours of painting time. Whilst it may feel counter productive, it’s hard to argue with the facts. Good quality paint sprayers are not cheap and it can be an expensive pill to swallow for many people taking their first step into the world paint spraying. With prices ranging anywhere from $100 to several thousand dollars, there is a lot of choice and a lot of different price points which leave most people confused and overwhelmed when they first start looking to buy a paint sprayer. We see the same questions being asked time and time again, so to save you the extra time in researching questions you most likely have, below is a summary of some of the most popular questions and answers about paint sprayers. A: No not really. Most domestic sprayers are designed to be easy to use for the average homeowner and come complete with an easy to understand manual and often an instructional DVD that will walk you through the setup, using of, maintenance & cleaning of your machine. There is also a huge selection of videos on Youtube that cover in-depth, the main brands and sprayers, how to use them and troubleshooting. A: This varies between the type of sprayer and the paint you have been using (water-based paints are much easier to clean out than oil-based paints). HVLP and conventional compressor spray systems are generally much easier to clean (around 10-15 minutes) as paint only touches the gun and doesn’t go through any hoses such as those found in airless paint sprayer systems. Airless paint sprayers often require more time to clean as you have to flush out the hose, piston, filters and gun. Cleaning an airless sprayer is not difficult, but can take up to 20 minutes due to the amount of water required and the extra parts that need to be cleaned. A: Yes, definitely. Different types of sprayers are best suited to certain applications and vice versa. For example; airless paint sprayers are almost impossible to use for smaller projects, such as furniture or painting doors. Airless paint sprayers are so powerful that they can cause paint build-ups and drips in a matter of seconds if they are not continuously moving. Likewise, HVLP systems are great at detailed work, yet are very slow so are not recommended for large surface areas such as walls. A: For every hour you spend masking, you will save around 4 hours of time you would have been using a brush or roller. Spraying is estimated to be between 5-10x faster than traditional roller methods (even with the extra prep time), that’s a huge difference. Not only that, but the finish is significantly better, you will use less paint covering the same surface area and you won’t break your neck, back & knees painting for 10 straight days. A: Yes and no. Many of the big names (such as Graco, Wagner, Titan, Fuji .etc) are mostly very similar, but what you should avoid is the cheap unbranded sprayers. These are more often than not, completely useless and should be avoided at all costs. If you spend less than $50 on a paint sprayer, you will most likely be put off spraying for life by the poor performance of the machine and shoddy finish you get. A: Every project is different so we can’t recommend a particular type of paint or brand. Though what we do recommend is that you avoid the cheaper paints (such as unbranded paints found on eBay) when using a sprayer as they often are not filtered very well in the factory and contain a lot of small particles which can block your spray tips and nozzles. This can affect both the finish you get and can cause a lot of frustrations as you have to continually stop to unclog the gun. A: The most common amount is 10-20%, but this may differ for your specific situation as there are too many variables such as the power of the paint sprayer, the thickness of the paint and even the temperature that day. Most paint manufacturers actually provide recommendations within their datasheets (here’s an Dulux example datasheet with recommendations on airless spraying setup requirements) on how much you should thin/dilute your paint for various spray systems. If you are struggling to find any guidance, we recommend starting at 10% and slowly adding more water until you get the results you are after (test it outside or into a bag, not on the object you are about to spray). You can’t do any damage to the machine by trying to spray a paint that is too thick, so a little bit of trial and error is often the best way. A: HVLP stands for High Volume, Low Pressure. 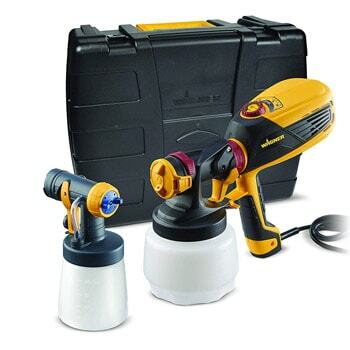 HVLP paint sprayers use high volumes of air at low pressures, which atomizes the paint at the gun nozzle which allows it to be sprayed with great control. HVLP is the preferred spray technology for detailed work such as furniture, cabinets, home projects, skirting boards & door frames. A: Spray tips or nozzles are generally associated with airless paint sprayers and spray nozzle needles are normally used with HVLP spray guns or conventional compressor spray guns. Paint thickness varies so much between different types of paint, you will normally need different spray tips to allow for thicker or thinner paint to flow correctly. This is most prevalent in airless paint sprayers as there is no adjustment of the spray size or hole diameter, meaning every type of paint needs the right size tip to work effectively. If you would like to learn more about spray tips, take a look at our Guide to Airless Spray Tips. A: If we’re honest, normally very. It does largely depend on the technology you are using though. HVLP systems use very low pressure (10psi) to operate and have a high 80% application rate, meaning only 20% of the paint either bounces off the object you are spraying or is lost as overspray mist. Airless paint sprayers are the messiest of them all due to the high pressures involved, airless paint sprayers have around a 50% application rate, meaning half the paint will end up in the air so EVERYTHING in the vicinity must be covered if you don’t want paint specs everywhere. The ideal environment for an airless paint sprayer is a newly plastered room with no carpets or furniture.